Crossing paths with the Serbian Ampino had been one of those encounters. It had set a new standard in true budget non T- or D-class transistors as MiniWatt would soon do thereafter for tubes. My enthusiastic Ampino review had created an unforeseen problem for designer Dejan Dobrin however. Pricing his 25/50wpc integrated amplifier at a shockingly low €220 had not accounted for the sadly disproportionate steep freight outside Serbia: €75 within the EU, €95 worldwide. Whilst the Ampino at €315 remains an insane value, the psycho barrier of spending 40% of its sticker on shipping held off many. "This we could not fix. 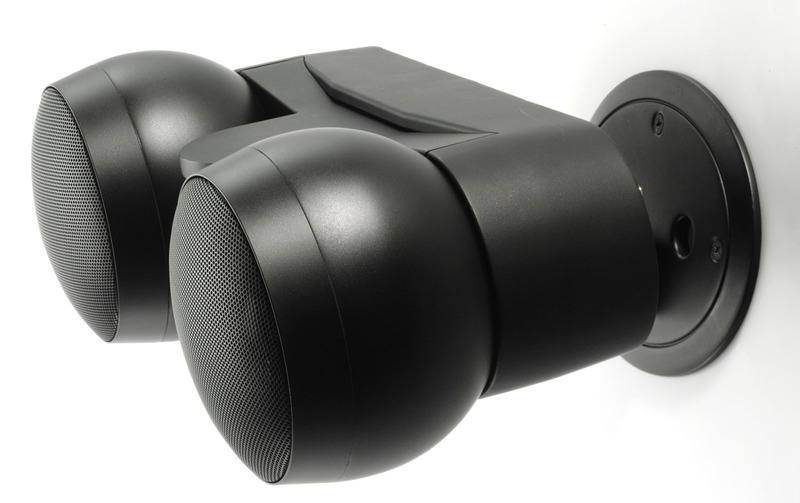 But the issue of mating Ampino to a commercial speaker in its budget range has now been addressed with our new Tizo speaker." 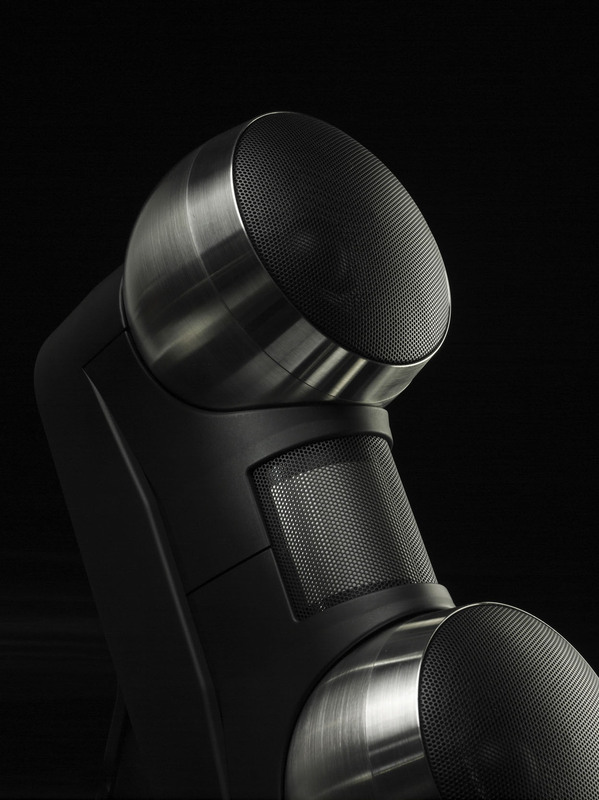 "It uses Peerless drivers, the 25mm ring radiator and a 3" mid/woofer to be precise. Crossover frequency is 2250 Hz. The cabinets are made from 19mm MDF, the port is in the back. Weight of the packed pair is approx. 8kg, weight per piece 3.5kg. The finish is natural wood veneer hand-rubbed with organic oils to maintain the natural look and acoustic attributes. "The crossover uses hand-picked parts like MCap capacitors by Mundorf and Visaton, our own Dayens air-core coils with very good copper varnish-dipped to prevent microphonic effects and MOX-type resistors from Mundorf and Visaton. It is preferable that the speakers be placed at least 50cm from the back wall (optimal is 70-100cm) and 50cm from the side walls." "Technical characteristics are a 2-way bass reflex concept with 8-ohm impedance, 25 - 80wpc amplifier power, 84.5dB sensitivity (2.83V/1m), 57Hz - 40kHz frequency response and 140 x 240 x 240mm dimension. I have attached a show photo to convey size. About our electronics you inquired about, we are working on a completely new series of Ecstasy VI amplifiers which will replace the existing Ecstasy IVse very soon." 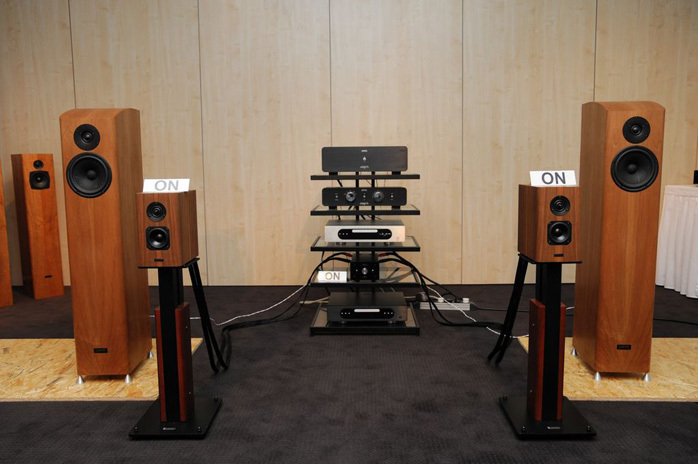 "Currently the newest models are the Ampino monoblocks whose first notes we just enjoyed. We expect that the Ampino monos will be ready for delivery by the second half of June. 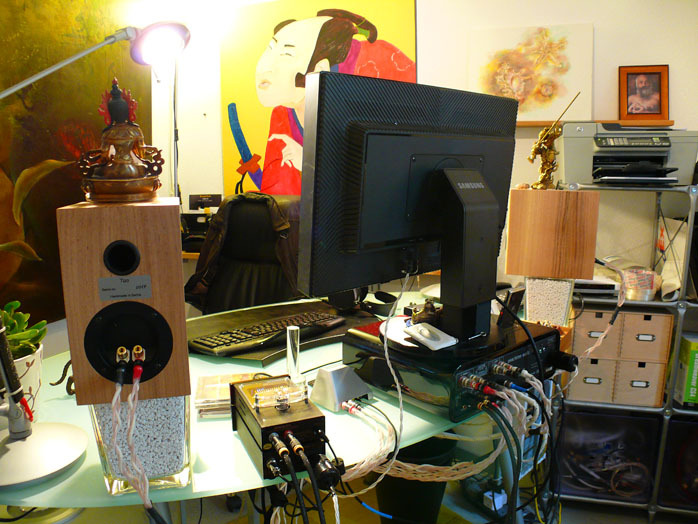 A passive preamplifier is under development to be perfectly matched to those monos. The Ampino preamplifier will be finished within the next 2 - 3 months." 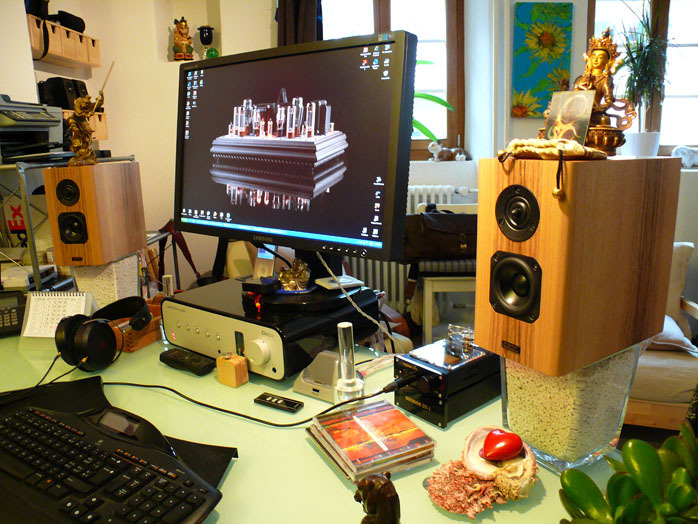 Breaking in Tizo on my work desk with the usual Peachtree Audio iDecco was a no-brainer. The speaker's narrow footprint fit on my Ikea glass planters with zero overhang. Unexpected at the price was the nicely bull-nosed baffle which smoothly segues into the sides to avoid lateral diffraction edges. Ditto the quality of the matte wood veneer. It really makes Tizo look as though hewn from solid wood. Unexpected too were the 1-inch thick side panels and dense cotton batting inside. All crossover parts are properly mounted to the floor and wired point to point. Concomitant with budget meanwhile were the inset black terminal cups instead of flashier cabinet-mounted posts by WBT & Co. and Philips wood screws rather than Hex bolts with counter inserts. 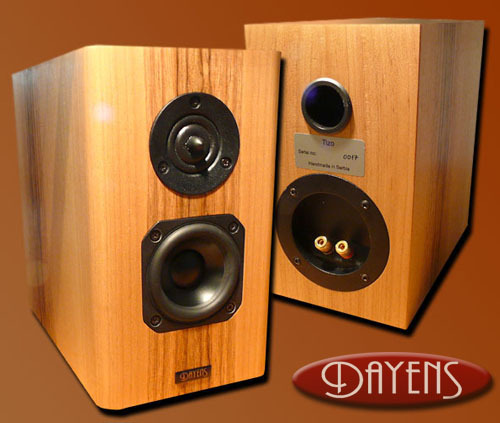 Armchair engineers and cynics will question the choice of 3-inch mid/woofer. Surely a beefier 4.5" or 5.25" unit would have fit? Possibly a former given the thick sidewalls. But, 3-inchers have a very particular midrange magic. The new TangBand flat-cone unit used by Sven Boenicke for example is a premium such specimen. It and its 4-inch mate are presently inspiring a very high-profile speaker designer to instigate an entirely new speaker line. 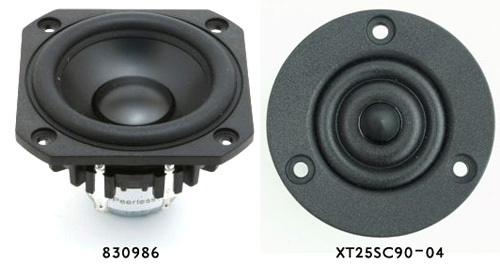 With sufficient cubic enclosure volume and bass-reflex loading—here via a very narrow but long port—such petite transducers can be made to put out sufficient bass to avoid sounding malnourished. That's relative of course. To stay honest, I had my Michael Kelly-designed era Sat 5s. Those are exceptionally buff in that department, considering. Off the desk top meanwhile, Ampino was itching to meet his baby sisters.